The new Model 828 (Patent Pending) offers pioneering technology that takes the guesswork out of angle duplication and eliminates the problems associated with analog readings and manual measurement transfer. Designed in-house by Generals engineering team, this is the first and only digital T-bevel on the market. It is ideal for measuring, storing and transferring inside and outside angles when building cabinetry, furniture and picture frames; installing tile and more. 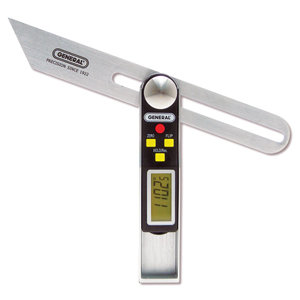 This highly accurate tool offers easy-to-read measurements via a large LCD display and integrates an 8" stainless steel blade with a steel locking knob. Practical function buttons make it ultra-convenient for setting and transferring measurements instantly.